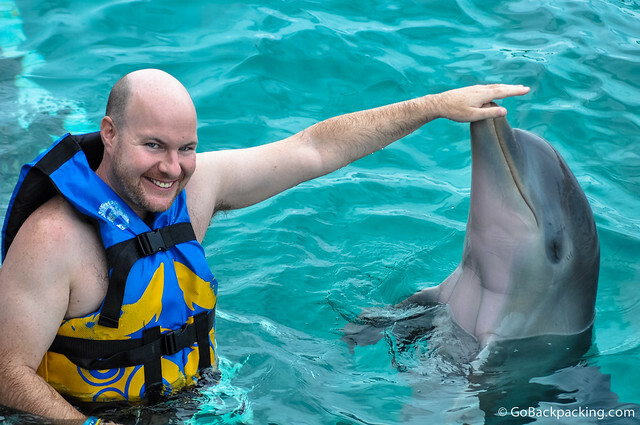 Dreams come in all shapes and sizes, and in the case of swimming with dolphins in Cancun, can include wet kisses and belly rubs too. My desire to swim with dolphins goes back to 2007 when I was on a snorkeling trip off the island of Moorea, French Polynesia. Our small boat puttered past luxury bungalows built over water. 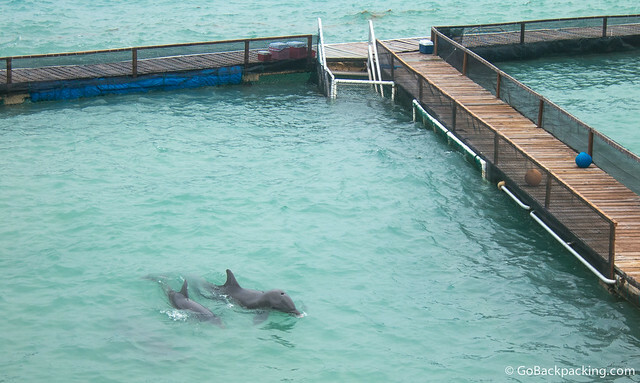 Outside the bungalows, in a fenced area of water, were guests swimming and playing with a dolphin. Since then, I've always associated the activity with luxury travel, but as I found out in Cancun, it's surprisingly affordable. 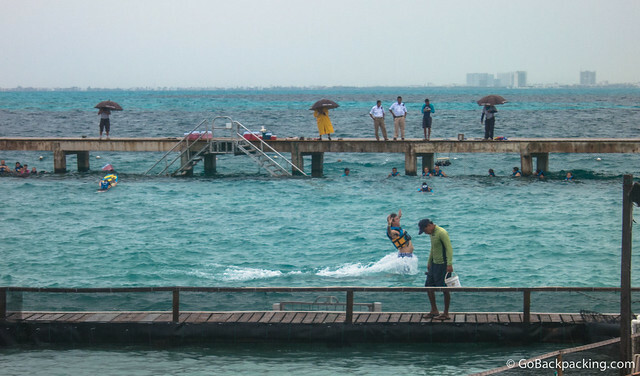 Judging from my recent dolphin encounter at Isla Mujeres, swimming with dolphins may be one of the most popular activities in the entire Riviera Maya. Booking a 10:30 AM swim, the earliest of three each day, meant arriving at Playa Tortuga ferry terminal in the area with Hotels in Cancun at 8:30 AM. There, you present your voucher and get a bracelet with your particular tour. There are a variety of different options to choose and prices to choose from, the bracelets ensure the boatloads of customers match up with the tours they purchased. 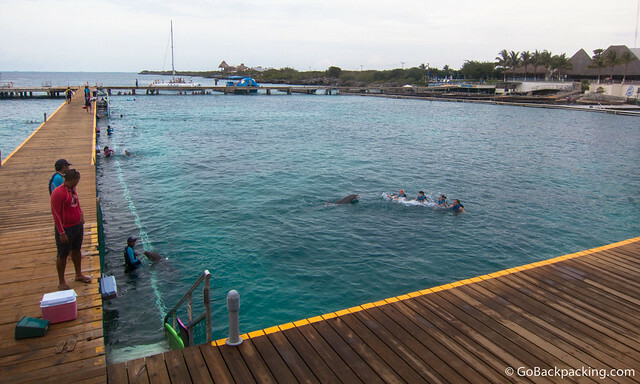 Dolphin Discovery, located on Isla Mujeres, operates a ferry. Bracelet on wrist, I left on the 9 AM ferry, along with excited tourists from around the world. There were lots of families with young kids, as well as couples, and groups of friends. The 45-minute ferry ride brought us to the southern end of Isla Mujeres, where the water is colder and more suitable for the dolphins. To my surprise, we pulled right up to the dock from which we'd later get in the water with the dolphins. Other customers and trainers were already in the water playing with them. After depositing our clothes and valuables in the free lockers provided, we were given life vests. Everyone got in groups based on bracelets. We were reminded no cameras, even waterproof ones, were allowed into the water. Each group would have a dedicated photographer taking photos, which were available later for purchase. There were about 39 people in my group, and it was then split up further into four sub-groups, with 10 people per trainer. I was assigned to a group with 8 Brazilians. The dolphin trainer, at a minimum, was trilingual, speaking Spanish, Portuguese, and English. We walked around the dock and removed our flip-flops in front of a metal staircase descending into the water. At the bottom of the staircase was an underwater platform made of rubber-coated fencing. A similar material stood vertically under the docks, creating a secure enclosure for the dolphins. The trainer immediately introduced us to our dolphin friend by having him glide by us, as we held out our hands to rub his belly. It was smooth and silky, which I later learned was because dolphins lose and regenerate their skin once every two hours. Next, the trainer demonstrated how we would each take turns kissing the dolphin. This was followed by a trick where we each took turns holding our arm out parallel to the water, with the dolphin standing upright to touch its nose to our hands. Everything was happening so fast, I didn't have time to truly appreciate what was happening, but I was enjoying every minute. Around this time, grey clouds began to descend on the island, and the winds picked up. Our trainer continued, unaffected. Trick number three had each of us taking turns swimming out about 10 meters with a boogie board, and then waiting for the dolphin to come from behind and push us by our feet. The trainer used what appeared to be a dog whistle, as well as hand motions, to call out the commands. By the time we cycled through all nine people in our group, the winds had kicked up the waves, and some were struggling to hold the right position. Life jackets ensured even the so-so swimmers were in no immediate danger, and on a couple of occasions, I saw a red-shirted lifeguard dive into the water to assist people in other groups. The next big trick has us swimming out 10 meters into the center of the pool once again. This time, we held one arm out perpendicular to our body. When the dolphin came around underneath us, we were instructed to grab ahold of his right flipper with our right hand, and then his left with our left hand, and he'd pull us back to the platform. The tricks with the dolphin pushing and pulling us weren't ones I anticipated, and they both caught me by surprise. I was merely happy to be in the water with these amazing creatures, but I did feel a little strange participating in the tricks which required such attention and energy from the dolphins. I would pay again just to spend an hour rubbing his belly, but I know many more people want the big tricks. If I were a kid, I know I would. The rain began to fall, but our trainer was intent to ensure everyone had a chance to do all of the tricks. I was looking forward to getting out, as the wind-kicked waves required one's attention. One of the last tricks involved us swimming out 10 meters as a group, donning snorkeling masks (provided), and watching underwater as the dolphin swam by us. When all the tricks were completed, we climbed back up the staircase. My flip-flops had been plunged between the boars in the dock to ensure they didn't blow away. The rain began falling harder, and we scurried back to the lockers, where we were provided towels. I dried off quickly, skipping the shower, and before I could reach the gift shop, realized I didn't get to ask our dolphin trainer any questions. I asked another trainer in passing if he had some time, and he replied that he did. We walked over to the railing, overlooking the dolphin pools, and I began to pepper him with questions. I kicked the impromptu interview off with questions about reproduction. At Dolphin Discovery, they have a mating program, and the baby dolphins stay with their mothers for two years. In the wild, it's typically three, but there are also fewer threats to them in captivity. Male Bottlenose Dolphins reach sexual maturity after 10 years, and females between 5-10 years. The average dolphin in the wild can live 25-30 years, with an additional 5-10 years possible when held in captivity. 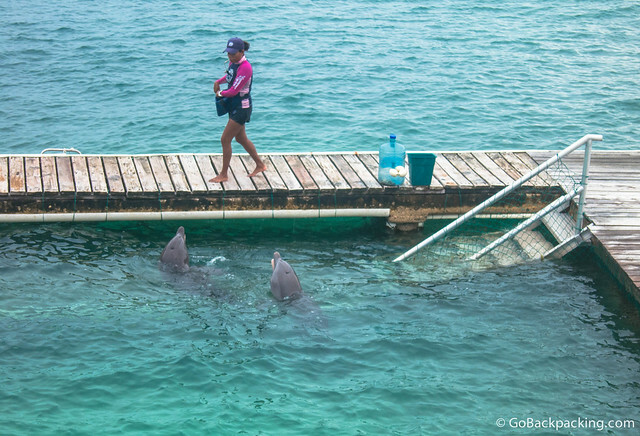 All the dolphins receive regular medical care, including daily check-ups before the customers arriving for their swims. He explained that each dolphin as his/her unique personality and their moods are continuously monitored. If a trainer determines a dolphin is having an off-day, for example, he/she isn't paired with customers. I was also curious about the trainers. While most have a background in marine biology or psychology, the trainer I was talking to got his start at the bottom. He began by separating the fish the dolphin would eat, removing the low-quality ones missing eyes, and stuff. Ten minutes later, I thanked the trainer for his time and headed for the gift shop. The rates were $25 for one photo or $50 for everything, but I didn't want most of them. When I told this to the girl helping me, she offered to meet me in the middle: three photos for $35. It's still expensive, no doubt, but when you're not allowed to take photos, you have little choice. The images were burned to a CD, which included some stock pictures of the dolphins as well. At 12 PM, the buffet lunch was served. A mix of typical Mexican food and Western favorites including pasta ensured there was something for everyone. The first ferry back to Cancun didn't leave until 3 PM, so I returned to the beautiful Playa Norte, where we stopped for lunch on my whale shark adventure the week before. I was provided with a complimentary dolphin swim in partnership with GetYourGuide. This article was updated in October 2018 in partnership with Melia.com. Great pictures! Looks like so much fun. I never even thought about doing something like this in Cancun, but it sounds like way more fun than the average resort experience. I do wonder how the dolphins fare in captivity vs. the wild, but its nice to hear that the trainers pay attention to ‘off’ days. I was told dolphins can live up to 10 years longer in captivity than in the wild, which makes sense since they’re protected, and fed regularly. I was lucky enough to have swum with dolphins in the Florida Keys back in 2004. It is definitely one of the best things I have ever done in my life.